Visitors to the National Gallery of Modern Art (NGMA), Mumbai, can now see the painting of a goddess dressed in finery, her four hands bearing the symbols attributed to Vishnu (a conch, a mace, a lotus and a chakra). Made by Mahadev Vishwanath Dhurandhar in 1899, the painting has been identified as Bhasmasura Mohini. In the Hindu pantheon, Mohini is the only female avatar of Vishnu, an enchantress and a destroyer of demons. If the first image of her that comes to mind is of a woman on a swing, her diaphanous white sari and lustrous black mane trailing behind, we have only Raja Ravi Varma to thank. The 19th century master painter and printmaker produced a widely circulated work, Mohini On A Swing, which fixed her image in the mind of most Indians. It’s a far cry from Bhasmasura Mohini, in which the deity is highlighted as the female embodiment of Vishnu, as the preserver of the universe, a gentle guardian. Varma’s Mohini outdid Dhurandhar’s in terms of popularity—the former an oleograph and the latter a painting. Scouting the sheer number of works at the retrospective MV Dhurandhar: The Romantic Realist at the NGMA, it would seem, at first glance, that Dhurandhar is an artist who merely occupied the universe of Indian art pioneered by Varma. Curated by Suhas Bahulkar, chairperson of NGMA’s Mumbai advisory committee, the retrospective honours Dhurandhar’s prolific contribution to both fine arts and applied arts. While doing so, The Romantic Realist incidentally severs the umbilical cord that public memory has grafted between Varma and Dhurandhar. It achieves this by stating the basics, a meet-and-greet with an under-recognized and often disregarded name in the cannon of Indian art, one whom the curator describes as both “a servant of the Raj" and “a painter of the soil". Born in 1867 in Kolhapur, Dhurandhar decided to pursue art after he saw Varma’s works. He enrolled at the Sir JJ School of Art in Mumbai, which instilled in him the style of realism prescribed by London’s Royal Academy of Art. His portraits are testimony to this—the idealized proportions for the human body, the use of chiaroscuro and the accuracy of detail. The year 2017 marked Dhurandhar’s 150th birth anniversary, and yet it passed without much fanfare. The reason why he never found great popularity, says Bahulkar, was possibly because of his neutral stand on the politics of the time, and the rising popularity of the Progressive Artists’ Group, which rebelled against academic realism in favour of a modernist idiom. “Dhurandhar was pilloried because he continued to accept imperial commissions, courting controversies when, for instance, he led a team of artists to paint pylons with images of Hindu gods and goddesses to welcome the foreign rulers in Bombay," writes Bahulkar in a book published alongside the exhibition. But the fact remains that Dhurandhar was a man of many firsts. He was the first Indian to be bestowed the title of Rao Bahadur, a recognition that the British Raj would subsequently reserve for those who served it exceptionally. He was commissioned by the government to paint murals (1928-29) for the imperial secretariat in Delhi. In 1930, he became the first Indian director of the Sir JJ School of Art. He was also the first Indian artist to be awarded a gold medal by the Bombay Art Society. These achievements, however, are not the focus of this exhibition. Through loans from the Maharashtra Directorate of Archaeology and Museums, DAG, Swaraj Art Archive and other sources, Dhurandhar is shown as an astute chronicler of his society, of a historic past, and of an eternal mythic time. A bride converses with her friend in A Scene Of Hindu Marriage; all eyes are trained on Shivaji in the court of Mughal emperor Aurangazeb; a mother and child gasp as a man is run over by a carriage. Dhurandhar was commissioned for several commercial projects. He illustrated Otto Rothfeld’s book Women Of India in 1920, Percival and Olivia Strip’s The Peoples Of India in 1944, as well as postcards depicting the various occupations in India. 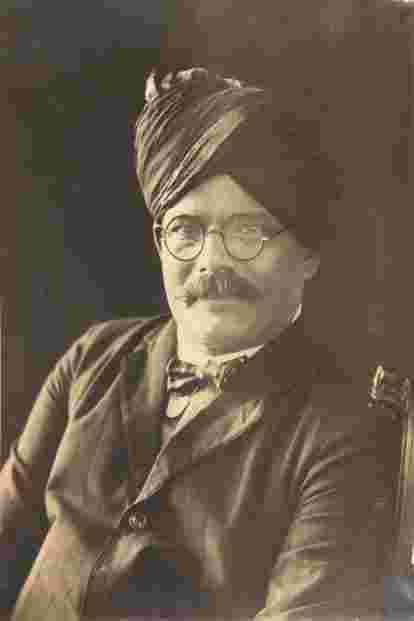 He was also sought out by Varma eventually and, if you look closely at some of the oleographs bearing the distinguished mark of the Ravi Varma Press, there will be Dhurandhar’s signature on them as well. It’s a collaboration waiting to be researched further. “It is only fair to accept that Varma was the first artist in this space, and that he had the advantage of a printing press (in Maharashtra), through which many of his works came into circulation, making them iconic," says Kishore Singh, director of DAG. While the book comments on the unique, and often problematic space, that Dhurandhar occupied in the history of Indian art, the retrospective itself is best viewed as an introduction, for it refrains from critically intervening in the narrative. It doesn’t address questions such as, what was Dhurandhar’s contribution as the first Indian director of a leading art school? Or, how did he negotiate his identities as Raj loyalist and Shivaji admirer? For now, however, let’s welcome Dhurandhar, as he is led out of the great shadow cast by Varma. The Romantic Realist is on at the NGMA, Mumbai, till 13 October. A parallel exhibition, MV Dhurandhar: The Artist As Chronicler, is on at the Dr Bhau Daji Lad Museum till 1 October.